To know yourself is to be yourself, yet one with the Whole, Edgar Cayce. The word threshold means a border between the exterior and the interior. It’s a kind of No Place. I’m always fascinated by how the mundane and the sacred sometimes overlap in this way. This can be at a place like Stonehenge or in a shady forest. But also in man-made things such as churches. On my trip tour around Spain I visited Valencia which has a very interesting cathedral known as Seu, after the area in which it’s in. Seu contains what is said to be the chalice used at the Last Supper. It is kept in a special chapel which is always dark so to give better effect to its precious centrepiece. I don’t care about relics but just sitting in that darkened space meditating on the interplay between the light and darkness, between the world of shade and the real one of light, I found very moving and peaceful. 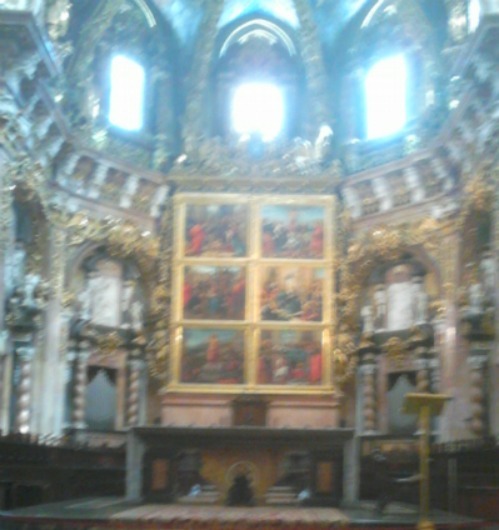 Incidentally that same cathedral has what’s known as the lantern altar (see above). Called thus because whatever way the light falls from the dome and hits the ornate upper panels it makes it look like a hanging lantern. The lower panels display paintings from the 14th and 15th centuries by an unknown artist. It all looks baroque or even rococo. Very beautiful. By the way the cathedral also contains two originals by Goya, as well as the severed arm (bit gruesome!) of Vincent Martyr, who's like the patron saint of the place. Well worth a visit should you find yourself in Valencia. 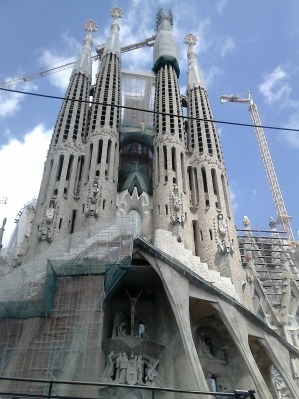 And speaking of cathedrals, of course I visited beautiful Barcelona and the Sagrada. When I first ascended from the metro I was hit with the Nativity gate, and went wow! But then when I walked round to the other side the Passion gate blew me away. All superlatives are inadequate. Just grabbed a beer, sat down, and drank it all in. The towers seem to go on up forever like gnarled bones, which is what they're meant to represent. Inside is amazing too and you must go to the top for a view over the city. 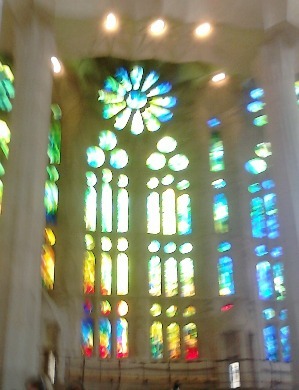 God pretending to be Gaudi. Hope I don’t sound too much like a tour guide! but really enjoyed my recent trip to Spain. Will finish on this next time. an interesting observatgion . . .
Had an interesting observation lately. I was sitting one afternoon in Insomnia coffee shop (great name!) here in Donnybrook when an old lady who appeared to be homeless came in. She wanted tea but had no money. At that point a man who was just walking past came in and paid for her tea and then left. The poor lady thought it was the guy serving her and was thanking him profusely. It reminded me that we never know the source of our good. Often we attribute it to one person or situation, while being totally oblivious to the real source. The kindness of those may touch us and we are totally unaware. Of course all our good really comes from one Source, what Cayce called the Whole. Neria: the lady who didn’t believe in the law of attraction. Healing to all our friends in Australia that the bush fires will be put out, and to the relatives of the two people who have already died. Thank you. The happiness of your life depends upon the quality of your thoughts. Therefore guard accordingly. Find your threshold and don’t be afraid to cross.